Every once in a while there comes a moment in a startup's life that you just know you'll look back on as defining. This is one such moment. Today we announce Frontdoor (http://frontdoorhq.com), our online Point-of-Sale service. As incredible as it might sound, setting up a Point-of-Sale system today still means a huge investment. First it's the expensive point-of-sale equipment out there, and the overpriced software from before the Internet. Then, you have to add the maintenance costs for that quirky hardware, as well as the (well) paid updates for the software to fix bugs and keep up with legal changes. 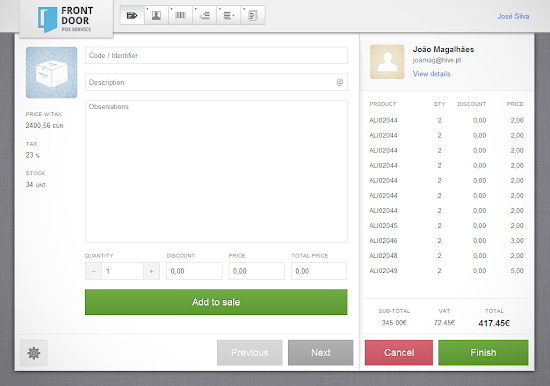 Frontdoor lets you sell anywhere from any device, be it PC, Mac, iPhone, iPad or Android. You can start using Frontdoor with just your pocket change, and only pay for what you use. Period. No surprise updates to pay for. No hefty maintenance costs for weird hardware you don't need. Frontdoor is about user experience, that's why we went to so much trouble to craft each user interface you'll see in Frontdoor. Anyone can build software that does the job, but to make it work in ways that delight you and make your life simpler... that's just beautiful. That's what we did with Frontdoor. Frontdoor is also about your data. We're going to set the data free from the application silos. You'll be able to use OAuth to securely authorize access to your data, which can then be combined with other information sources. Open up to new, unexpected uses and insights from your data. Frontdoor is about bringing the power of advanced analytics to small and medium business. Business intelligence is not just for the big boys anymore. Beta starts today. Expect public availability this Spring. So if you know anyone running a store these days, you owe it to them to at least mention the new kid in town. We're proud to announce that Colony Framework now supports Modular Configuration. What this means is that you can now load and unload configurations, in runtime, in the same you way could already load and unload Colony plugins. Colony configurations do to data, what Colony plugins already did to logic: they remove the need for restarts, promote modularity and make distribution transparent. For instance, you could fire up a Colony instance, throw in a CPX file containing the HTTP server plugin and then throw in a CCX file (Colony Configuration file) which would set your HTTP server to act as a proxy. You could then pop in a new CCX file which would completely reconfigure you server to act as a simple file system navigator. All of this without ever having to stop your instance or even reload your HTTP server plugin. Pretty cool, huh? For a long time now, the configuration facilities in Colony were seriously underdeveloped compared to the other parts of the technology. We had been wanting to fix this almost straight after the configuration infrastructure was set in place. Until now, like with every other system in the world, changing the core configuration options of any component would require restarting the instance. This can be fine for a lot of people, but when you support loading and unloading components in runtime, having to reload because of a settings change always seemed a bit awkward. Modular configuration also comes with a high content of distributed AWESOME. Think about Colony Distributed, and how easy it now will be to deploy work units to remote plugins. We could already ship plugins to distributed instances, now we can ship them with precise indications on how the host instance should use the plugins: the configuration file. Try that on a regular distribution framework! So the alpha is out. Everybody we were showing Colony to lately was saying we had to release it because people needed to know about that kind of awesomeness. But we are people of work, not of show... So we kept on working, ironing out the wrinkles and such. We even started working on documentation and, again, people who looked at it were asking why we didn't have it online. So things added up, we polished a bit more, and felt it was as good a time as any to put something out there. We didn't pimp it much, just some places where like-minded individuals hang out. We got some mixed feedback between people amazed at the amount of work we had put into this thing, while staying under the radar, and others having a hard time understanding what it was good for. But, most interestingly, we found some people that actually felt the kind of pains Colony was intended to ease. And they wanted to know more. We got several requests for a forum for users to exchange experiences using the technology, and we got a tip about creating the #colonyframework IRC channel to help connect even better with the audience. And so here we are. We have something that you can already start calling documentation to. You can also check out our daily builds. To get an insider perspective on the project consider joining the Colony Users mailing list.